Tick is a cyberespionage group primarily targeting organizations in Japan and the Republic of Korea. The group is known to conduct attack campaigns with various custom malware such as Minzen, Datper, Nioupale (aka Daserf), and HomamDownloader. Unit 42 last wrote about the Tick group in July 2017. Recently, Palo Alto Networks Unit 42 discovered the Tick group targeted a specific type of secure USB drive created by a South Korean defense company. The USB drive and its management system have various features to follow security guidelines in South Korea. The weaponization of a secure USB drive is an uncommon attack technique and likely done in an effort to spread to air-gapped systems, which are systems that do not connect to the public internet. In addition, our research shows that the malware used in these attacks will only try to infect systems running Microsoft Windows XP or Windows Server 2003. This is despite the fact that the malware appears to have been created when newer versions of Windows software were available. This would seem to indicate an intentional targeting of older, out-of-support versions of Microsoft Windows installed on systems with no internet connectivity. Air-gapped systems are common practice in many countries for government, military, and defense contractors, as well as other industry verticals. We have not identified any public reporting on this attack, and we suspect the Tick group used the malware described in this report in attacks multiple years ago. Based on the data collected, we do not believe this malware is part of any active threat campaign. In the research below, we outline our findings around SymonLoader. We do not currently have either a compromised USB drive nor the unknown malicious file we believe is implanted on these devices. Because of this we are unable to describe the full attack sequence. Because we do not have either a compromised USB drive or the unknown malicious file, we are also unable to determine how these USB drives have been compromised. Specifically, we do not know if there has been a successful compromise in the supply-chain making these devices, or if these have been compromised post-manufacturing and distributed using other means such as social engineering. Unit 42 hasn’t identified the initial delivery method; the overview of the infection process is shown below in Figure 1. First, the attacker tricks users with a Trojanized version of legitimate software to install the loader program, which is a new tool to Tick we’ve named “SymonLoader”. When executed, the loader starts monitoring storage device changes on a compromised machine. If SymonLoader detects the targeted type of secure USB drive, it attempts to access the storage through the device driver corresponding to the secure USB and checks for strings specific to one type of secure USB in the drive information fields. Then, it accesses a predefined location of the storage on the USB and extracts an unknown PE file. As we described in a previous blog last July, the Tick group Trojanized a legitimate program and embedded malware called HomamDownloader. The attackers then sent the Trojanized legitimate applications as attachments to spear phishing email targets. When executed, the Trojanized legitimate application drops HomamDownloader and installs the legitimate program. Recipients may not be aware of the malware as the legitimate application works as expected. In our research into these latest attacks, we found additional legitimate Trojanized Korean language software since publishing out blog last year (Table 1). Similar to the previous samples we examined in July 2017, these newly Trojanized legitimate programs also drop HomamDownloader. Also like we saw in our July 2017 research, HomamDownloader can install other malicious files from the remote C2 server; in this case, pre.englandprevail[.]com. During our investigation, we found an interesting sample on January 21, 2018 (Table 2). Similar to the samples listed above, this sample is a Trojanized version of a legitimate program and drops malware. In this case, the Trojanized application is a Japanese language GO game. Instead of installing HomamDownloader like we observed in July 2017, this Trojanized program installs a new loader we’ve named SymonLoader. SymonLoader extracts a hidden executable file from a specific type of secure USB drive and executes it on the compromised system. Unfortunately, we do not have a copy of this file. Despite the differences from previous samples, we believe this sample is related to the Tick group because the shellcode in the Trojanized Japanese game is exactly the same as that found in the Trojanized Korean programs described earlier. 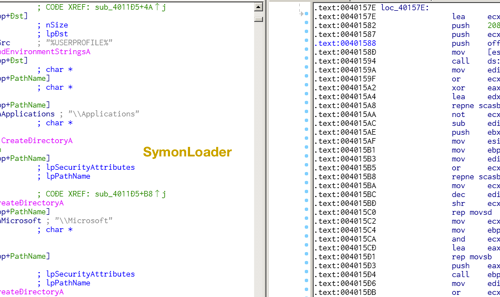 Also, SymonLoader shares code with HomamDownloader (Figure 2). The Tick group is known to develop and consistently update custom tools. As such, code reuse like this is consistent with their development practices. SymonLoader first checks the operating system version of the target host and if it is newer than Windows XP or Windows Server 2003, it stops working. According to the timedate stamp in the PE header, the malware was created on 26 September 2012. Both Windows 7 and Windows Server 2008 were already released by then if the timedate value is not modified. After checking the OS version, SymonLoader creates a hidden window named “device monitor” that starts monitoring storage device changes on the compromised system. When a removable drive is connected the malware checks the drive letter and drive type. If the drive letter is not A or B, and the drive type is not a CDROM the malware calls CreateFile API and gets a handle to the storage device. By excluding drives A and B (typically used for floppy drives) and CDROM drive types, it appears likely that the malware is targeting removable USB drives. 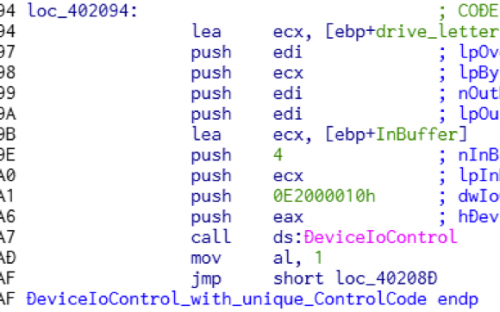 Next, the malware calls the DeviceIoControl() function with an undocumented custom control code, 0xE2000010 (Figure 3). The control code consists of four different types of values; DeviceType, Function, Access, and Method. In this case, the DeviceType value is 0xE200 computed as: (0x0E2000010 & 0xffff0000)>>0x10. According to Microsoft, this specific DeviceType value should be in the range for third-party vendors. To function properly, the third-party driver needs to be present on the compromised system before the malware calls DeviceIoControl() with the custom control code 0xE2000010. But which third-party driver? There is a clue in the next function. SymonLoader gets device information by SCSI INQUIRY command using the IOCTL_SCSI_PASS_THROUGH parameter and determines if it is the targeted drive by searching for a specific string in the Vendor or Product identification on INQUIRY data. Our research into the string used in these searches showed a company in the South Korea Defense Industry whose name matched the string. This company develops information and communication security equipment used by military, police, government agencies and public institutions. In a press, this company announced that they make secure USB storage devices that are certified to meet security requirements set out by South Korea’s IT Security Certification Center (ITSCC (English)). 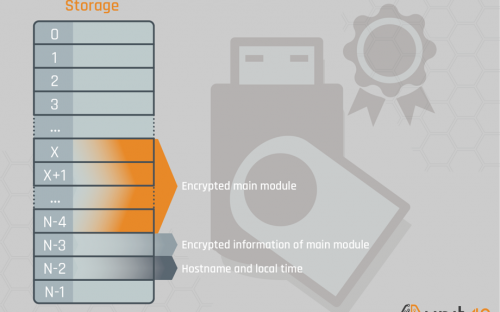 In South Korea, certain organizations are required to follow the “USB storage medium guideline” and using only the devices passed the audit by the government agency. For example, the guideline of the Ministry of Unification of South Korea defines the USB memory and management system introduction procedure at section 4, item 1 (Figure 4). Google translation from Korean to English follows. We found the third-party device driver in question in the installer of the secure USB drive in a public sample repository, and confirmed it supports the custom control code, 0xE2000010. The driver provides some functions to applications, including access to the corresponding secure USB volumes. We feel this evidence shows that the malware attempts to work only on the secure USB product made by this particular company. If SymonLoader finds it is on a Windows XP or Windows Server 2003 system and finds that a newly attached device is a USB drive made by this particular company, then it will extract an unknown executable file from the USB. While we do not have this file, we can glean information about it by analyzing SymonLoader and the third-party driver. The attacker encrypted the unknown executable file and concealed it at the ending part of the secure USB storage in advance. The hidden data is not accessible through logical file operation APIs, such as ReadFile(). Instead, SymonLoader uses Logical Block Addressing(LBA) and SCSI commands to read the data physically from the particular expected location on the removable drive. LBA is a simple linear addressing scheme. Storage is divided into blocks by fixed size, and each block has a number starting from zero to N-1, depends on the volume size. Applications can specify the block number and access the data by SCSI commands. Obtains final Logical Block Address(LBA) of the storage “N-1” by using the READ CAPACITY (10) command. Read the third last block “N-3” by READ (10) command and decrypts it. From the decrypted data, gets the LBA “X” where the main module locates. Loads data from LBA “X” to “N-4” by READ (10) command and decrypts it. Saves the decrypted file as %Temp%[random characters].tmp and execute it. Writes hostname and local time of the compromised system at LBA “N-2” by SAVE (10) command. Figure 5 shows the data layout of the malicious storage from the perspective of Logical Block Addressing. The Tick group uses Trojanized legitimate applications to trick victims into installing first stage malware, mostly HomamDownloader. 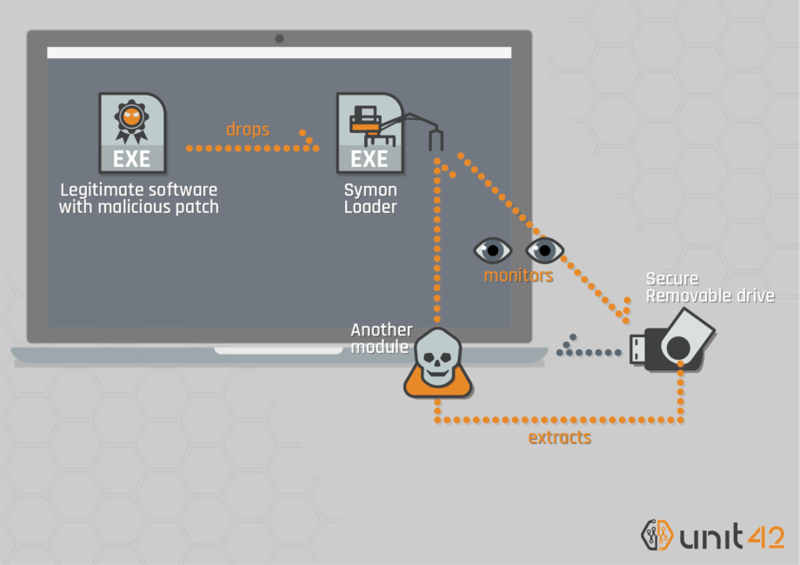 In this research, we identified a previously unknown loader malware being dropped instead of HomamDownloader, which was most likely used in attacks multiple years ago. In contrast to HomamLoader, which requires an Internet connection to reach its C2 server to download additional payloads, SymonLoader attempts to extract and install an unknown hidden payload from a specific type of secure USB drive when it’s plugged into a compromised system. This technique is uncommon and hardly reported among other attacks in the wild. While we do not have a copy of the file hidden on the secure USB, we have more than enough information to determine it is more than likely malicious. Weaponizing a secure USB drive is an uncommon technique and likely done in an effort to compromise air-gapped systems, which are systems that do not connect to the public internet. Some industries or organizations are known for introducing air gapping for security reasons. In addition, outdated versions Operating Systems are often used in those environments because of no easy-update solutions without internet connectivity. When users are not able to connect to external servers, they tend to rely on physical storage devices, particularly USB drives, for data exchange. The SymonLoader and secure USB drive discussed in this blog may fit for this circumstance. All samples discussed are classified as malicious by the WildFire sandbox platform. All identified domains have been classified as malicious. AutoFocus users can track the malware described in this report using Tick campaign tag, SymonLoader and HomamDownloader malware tags. Customers running Traps are protected from the discussed threats. The post Tick Group Weaponized Secure USB Drives to Target Air-Gapped Critical Systems appeared first on Palo Alto Networks Blog. Application Framework Highlights and More from Ignite ’18 USA!